I hope you’re getting rain. We got a little bit last night and it’s threatening to rain, today. The clouds are hanging low and the wind is a cool 65 and I feel for a minute that it could be late September instead of the middle of July. I live for cold weather and I’m still a little perplexed by why I live here, in the desert. I grew up around here – maybe that’s it. We long for things unfamiliar or for the relief we feel on the rare occasions we get a break from our usual reality. I hear people in Seattle long for the beach. I bet they don’t long for the desert, though! Another comforting thing about food is the ability to transport myself into a feeling or a mood simply by the dish I prepare. Caprese salad makes me long for summer nights, spice cakes make me wish for Christmas, chocolate chip cookies make me think of home. A warm bowl of chowder with a thick slice of cornbread and a cold slab of butter puts me in the mood for a cloudy day and cooler temps. 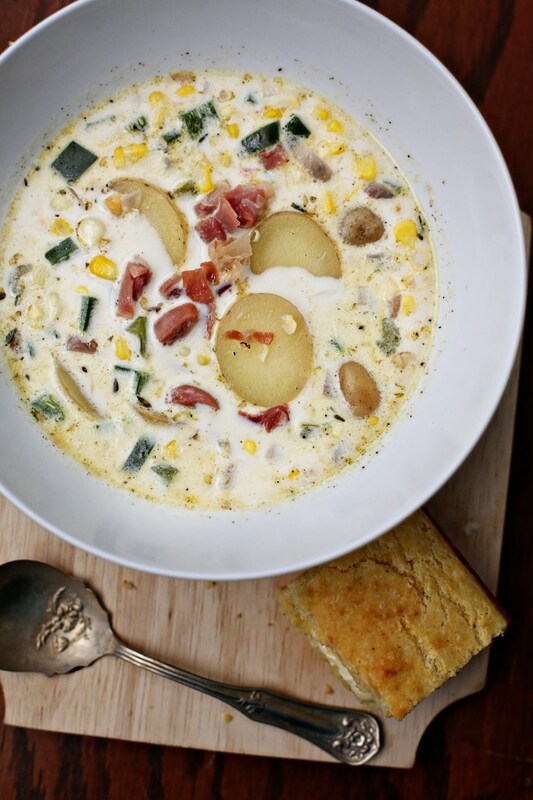 So, in the middle of the heat of the summer, on this cooler week with cloudy days and threatening rain, let’s make a memory with a warm bowl of corn chowder and pray the rain stays a while. Place bacon in small stockpot over medium-high heat. Cook, stirring occasionally, until bacon is deep golden brown and all the fat has been rendered, about 4 minutes. Remove bacon with slotted spoon, transfer to paper towel, and set aside. Discard all but 2 tablespoons of bacon fat. Add onions, celery, thyme, and salt and pepper to taste to stockpot; cook over medium-low heat until translucent, about 8 minutes. Add stock; bring to a boil. Reduce heat to medium; simmer 15 minutes. Add corn, potatoes, and chile; cook until potatoes are tender, 10-20 minutes. Remove and discard thyme. Add half-and-half, and simmer until soup is hot. Adjust seasoning with salt and pepper, and garnish with the reserved crisp bacon pieces. We only make one cornbread recipe, anymore. The New Best Recipe is a wonderful encyclopedia of how to make every recipe basically, perfect. We love this book and it never steers us wrong. It’s quite bulky, but all the recipes are tested extensively and done in a myriad of ways, and they give a background as to why the recipes work. It’s very trust-worthy and a definite go-to in times of need of a solid recipe! 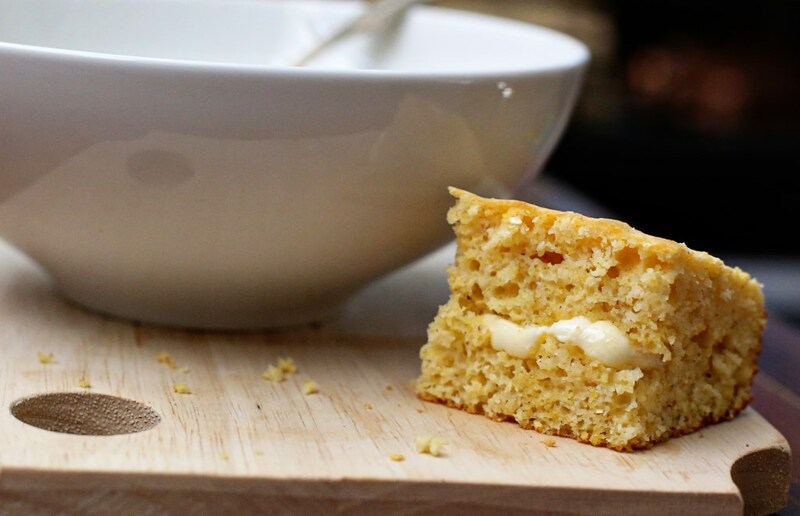 Their Golden Northern Cornbread is our go-to cornbread recipe. It’s light, fluffy, moist and slightly sweet. Holds together beautifully to be a base for your bowl of soup, or just on the side with some cold butter. Adjust an oven rack to the center position and heat the oven to 425 degrees. Grease a 9 inch square baking pan with butter. Whisk the cornmeal, flour, baking powder, baking soda, sugar and salt together in a large bowl. Push the dry ingredients up the sides of the bowl to make a well. Crack the eggs into the well and stir lightly with a wooden spoon, then add the buttermilk and milk. Stir the wet and dry ingredients quickly until almost combined. Add the melted butter and stir until the ingredients are just combined. Pour the batter into the greased pan (we actually love to use our cast-iron skillet for this recipe). Bake until the top of the cornbread is golden brown and lightly cracked and the edges have pulled away from the sides of the pan, about 25 minutes. Transfer the pan to a wire rack to cool slightly, 10 minutes. Cut and serve warm! This entry was posted in Breads, Butter, Hearty, Monday Meals, Soups, Uncategorized, Vegetables and tagged chowder, corn, corn chowder, cornbread, cornmeal, Martha Stewart corn chowder, soup, stew, stone ground cornmeal, The Best New Recipe cookbook. Bookmark the permalink.